...the perfect show for libraries, schools, family nights, aftercare programs, pre-schools and camps. This wild, fast moving comedy show is a hit with families and kids of all ages. Award winning songs about toasters and beans mixed with circus quality juggling and amazing magic tricks! An imaginary friend pays a visit and helps sing a duet, a wise cracking robot bird tries to get on American Idol, and Reggie - the funniest dog in the world - plays the piano and reads an audience member’s mind. This is the funniest, most unusual family show you will ever see. John Hadfield once again hits the bullseye with this outrageous musical comedy / variety show aimed at kids and their families. 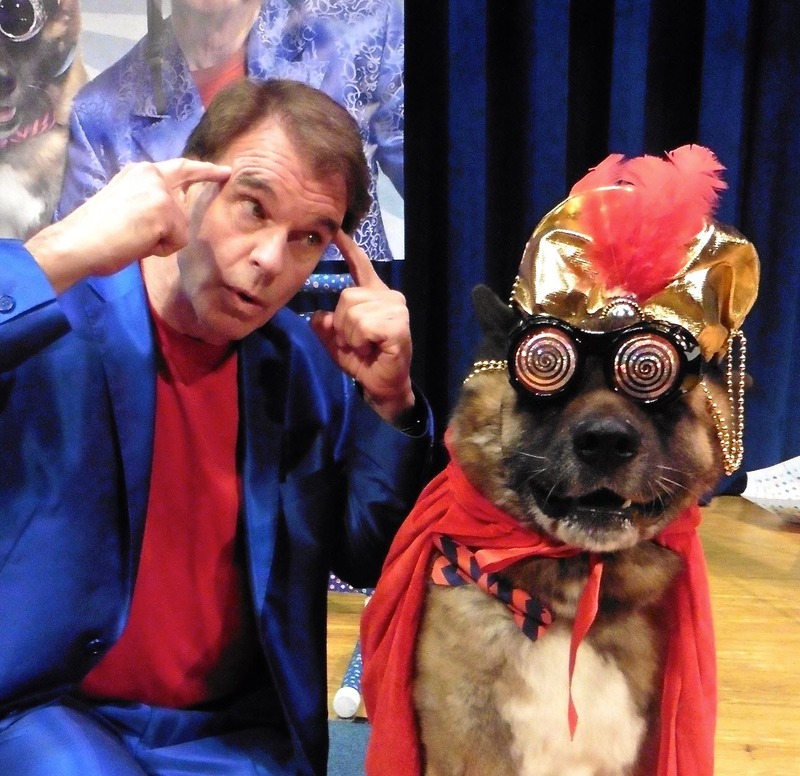 This presentation features original funny songs, plate spinning, amazing magic, comedy, circus quality juggling, audience participation, whoopee cushion percussion, a heckling robot bird and a lovable (real) mind reading dog named Reggie who steals every show as well as the audience members’ hearts. The show is an instant hit at schools, libraries, festivals, after school programs, family nights and camps. Reggie the dog adds a fantastic sweet layer to the show. Reggie completed the Karen Pryor Academy’s Professional Dog Trainer’s course as John’s partner, and is his demo dog for his weekly Dog Tricks class at The Academy of Dog Training and Agility. As the world’s only performing Akita, his skills are out of this world - but his sweet gentle personality wins the kids over immediately. When Reggie is introduced and walks out slowly to the performing area (and stretches) like a big old Teddy Bear, John announces how excited Reggie is to be here - and Reggie gives a BIG yawn and looks at the audience like “Where am I and how did you kids get into my bedroom?” the kids totally crack up. With slow goofy music playing behind him, Reggie seemingly performs his tricks reluctantly - much to the audience’s delight. He plays the piano, finds John’s keys, turns the lamp on and off after John claps his hands twice (clap on… clap off…), puts away his toys, and he actually reads the mind of an audience member. After each trick, the audience members LOVE to shout “GOOD BOY, REGGIE”! 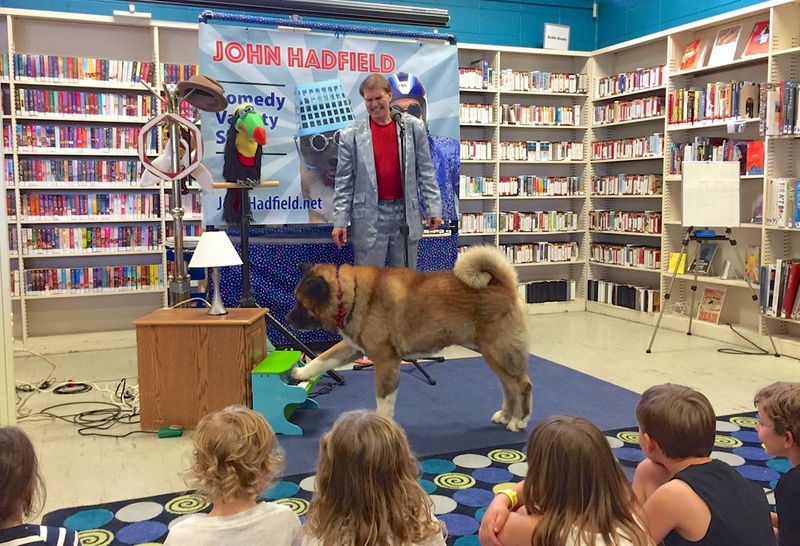 John Hadfield’s One Man (and one dog) Comedy show will have kids and families laughing, cheering, and even sitting in jaw dropping surprise. 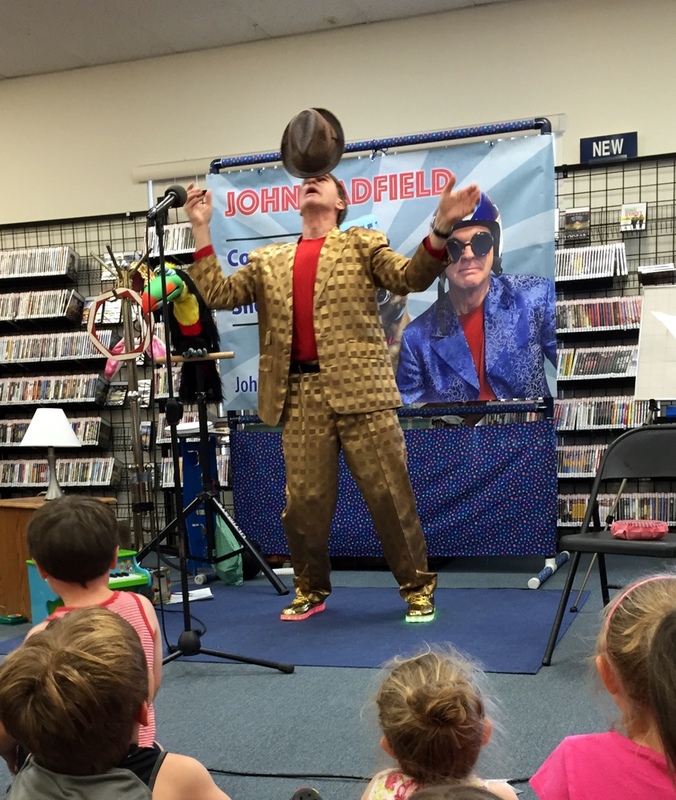 But this show is not all just silly fun - John’s imagination is infectious, and his songs and stories will inspire kids to think and create long after the performance is over. When he shares stories of how Reggie the Dog overcame an early puppyhood injury, learned to perform his complex tricks using positive training, and how he and John actually became a team - it’s inspiring to kids, parents and teachers alike! Call or email now to schedule this exciting unique show for your next event and be part of the adventure.